If you believed everything you read about apple cider vinegar (ACV) online, you’d think there’s no problem this inexpensive pantry staple can’t fix. However, if you’re wondering if ACV is good for acne, scientific research hasn’t shown that to be true. You’ll find reviews from people who swear by ACV, but, in truth, using apple cider vinegar for acne is liable to do more harm than good! The whole idea of using vinegar from apple cider as a cleanser or toner for acne-prone skin has to do with the fact that it’s natural—everyone has heard of apple cider—and is an acid. All vinegars have some amount of an acid known as acetic acid. White vinegar, the kind many people use for housecleaning, is standardised to 5% acetic acid, but apple cider vinegar’s acetic acid content isn’t standardised. 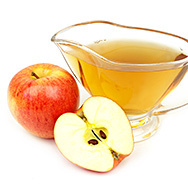 That means that the acid content of ACV varies from brand to brand, or even from batch to batch within the same brand. Why is the amount of acetic acid important? Because even low amounts of it can irritate and be drying to skin. In fact, acetic acid can actually burn skin! That’s why you’ll often see the recommendation to dilute apple cider vinegar with water before applying it to skin. But, even if you take the precaution to dilute the apple cider vinegar with water before using it, using vinegar for acne just isn’t a good idea. There are too many other, more effective, safer, and faster-acting (and better-smelling) products and ingredients to consider. How did apple cider vinegar for acne become a thing? Although there’s no research proving acne treatment with apple cider vinegar works, research has shown that acetic acid has antibacterial properties. But, even then, acetic acid was only shown to work against some types of bacteria, not the specific type that plays a role in acne. It seems the researchers simply figured that if it works for some types of bacteria, then it must work for all bacteria—that’s not the case. Vinegar’s natural acidity does allow it to dissolve dead skin cells that contribute to breakouts and clogged pores. That may make it tempting to try, but we strongly recommend that those with acne stick to the research-proven ingredients that, when carefully formulated, deliver effective results without irritating skin. The top over-the-counter contenders are benzoyl peroxide and salicylic acid. Those two ingredients, which are present in Paula’s Choice Skincare CLEAR products, are the gold standards for getting and keeping blemish-free skin—save the ACV for salad dressings!